The topic is esoteric for me. If I can just “BE” I would just want to “be”. Unfortunately until my mind runs round I would keep on BEcoming rather than just being someone/somebody. I am a wanderer, not physically as much but yes the mind does not stay at one place. You can check – I have found relationship between spirituality and business. I have written how technical methodology (TRIZ) can be associated with business. These are signs of my hyper active (rather wanderlust) mind. 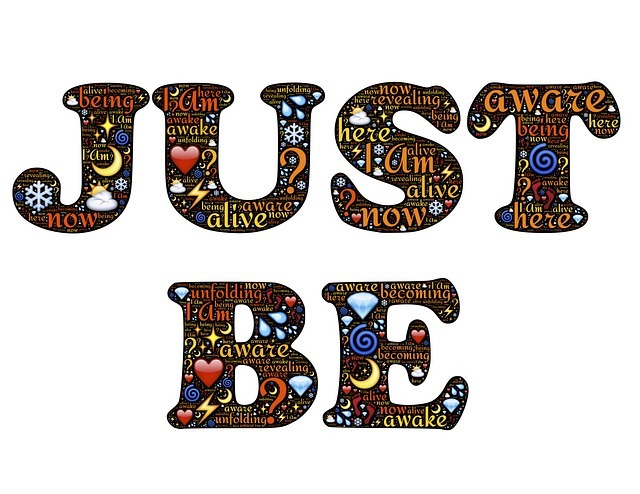 Can I just “be” – if yes I would just “BE”. A final thought – how about BEing the Buddha? The Buddha of this age? This topic was suggested by Shackman, for the weekly Friday Loose Bloggers Consortium where currently nine of us write on the same topic every Friday. I hope that you enjoyed my contribution to that effort. The eight other bloggers who write regularly are, in alphabetical order Ashok, gaelikaa, Lin, Maxi, Padmum, Rummuser, Shackman and The Old Fossil. Do drop in on their blogs and see what their take is on this week’s topic. Since some of them may post late, or not at all this week, do give some allowance for that too. I asked Professor Mankad (Sir). He explained it to me in detail. I loved learning that big picture from him. I must admire President Obama for the way he has put in his plan. Everyone in US Admin knows that “We are in trouble”. But how to get your idea win, should be learnt from Obama & Team. When Sir explained whole thing with immense patience, I thought about what could be the solution. Sir also suggested that what are the possibilities and what could be the likely future? I felt – we are (going to be) in deep trouble. Sir suggested that this trouble could be even deeper, longer and disappointing than the 2008 melt down. I’m scared. For all such troubles I always look at the other side as solutions. OTHER SIDE here means socialistic approach to solving capitalistic problem. I smsed Sir – could “Sanjha Chulha*” be the solution? It would help provide few jobs for people in Sanjha Chulha and reduce expenditure of unemployed on food. When that happens, Govt can reduce expenditure of unemployment benefits. *Sanjha Chulha means community kitchen. The other approach I thought was using TRIZ. Actually that is what Govt must be doing (without the jargon of TRIZ). Before discussing the solution framework, a brief on Fiscal Cliff (Details – About link and Wiki link). Fiscal Cliff – is a deep impact due in the budget of Govt. Because as per “Bush tax cut” (of 2003) the taxes would increase at the same time Govt has to reduce spendings e.g. unemployment benefits offered for 99 weeks would reduce to 52 weeks, defense budget reduce by say 50% etc. All of this would result in recession in the USA. The challenge for Govt is – how to control it? Fiscal Cliff is also a function of debt reaching a ceiling % of GDP. In TRIZ there is a solution type for such issues. That is named as physical contradiction, which means you want something and you dont want that at the same time. You want Tax cut and you dont want that. You want reduced expenditure but you dont want that. Simple solution is – “increase ceiling debt as % of GDP”. Other solution would be, TRIZ offers solution by separation principle. 1. Separate tax collection based on condition. This is tried arguement is on tax ceiling (Obama says 400k, Congress says 1M). 2. Separate tax collection based on organization vs individuals. In TRIZ it is kind of separation of parts Vs the whole. 3. Separate tax collection on time. This separation could be coupled with solution 1. 3. Separate spends on time. Delay spends which could be avoided. For testing all these ideas a very simple mathematical model and “goal-seek” of Microsoft Excel can be used. (Though its not that simple – but who wants to complicate things? Objective is to simplify life) politicians/consultants like complexity, who can leverage it. “My name is Tweek. And yours?” cheeped the voice. “My name is Lenny, but I don’t have time to stop and talk,” Explained Lenny. “I have to get home and wait for a friend”. “May I wait with you?” asked Tweek. “If you want to, but don’t disturb me,” replied Lenny. “So what does your friend look like? when is he coming?” asked Tweek. Believe it or not, the search/wait is on…. everyone of us is searching for something. TV channels are searching for next sensational singer or dancer. News channels are searching for next breaking news. Box office is searching for its next bigger hit or super star. Citizen of India in general for good governance and so on. Whatever said and done, search is on. When we turn to individual, the search is for a better friend, good house, better life style, peace of mind, love or a superior job. No doubt search is on. Many a times what is observed is that the search is on but one does not know what is that he/she is searching for. When an organization is on the journey of innovation, not knowing what is required becomes a very big problem. In my innovation consulting and TRIZ learning I used to have a framework for removing the problem of not knowing what are we searching for. The method is Ideal Final Result (IFR). The concept of IFR seeks the destination or best solution in the beginning itself. This method helps identifying what are looking for and where we want to go? So what are you searching for? By the way, when the Buddha was searching (enlightenment), he could not attain that. However, when he even dropped the idea of “searching” he achieved it! To start off – the Buddha knew what he is searching for. 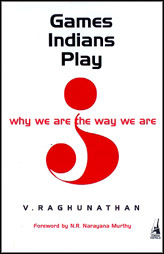 Have you read Games Indians Play! by Dr Raghunathan? Very interesting book with pertinent examples of issues we face, many a times overlook and are facing worldwide. In that book he says – “We are individually very smart but collectively dumb”. I think we are collectively dumb and therefore we are in the economy-related mess we have created. I did not know that I would be referring to my new year blog so early in this year. Newspapers of 3-Feb-2012 made me do so. The news was about the 2G scam which had been under scrutiny for a long time now. In my opinion the verdict clearly stated that power corrupts and it gives you confidence that you can get away with murders too (many such cases pending in India)! I thought hard – really very hard – to find a solution. I think I will go back to TRIZ (theory of Inventive Problem Solving) to decide conflicts and resolving them. Until I find a one size fit all ‘man made’ solution, I could think of only one possibility. This solution is self restraint, and owning responsibility to make sure we are morally correct. This word ‘Moral’ reminds me of my economics and business ethics class of MBA where we discussed moral hazards with Prof Mankad and Prof Arun Ramanathan. I was reading this article on Moral hazards at Wharton. The article talks about authorities and new stringent rules. This regulatory authority will tomorrow need another (other set of rules) and so on and so forth. How long will we create such authorities? Moral hazards would end very easily when each one takes responsibility and become accountable for his/her action. This accountability has to come on each level and for all the actions. The problem lies with a reality that – ‘We are individually very smart but collectively dumb’. This ‘being individually smart’ begets moral hazard. The solution for this problem is one’s own self. Take responsibility own it and be accountable. Perhaps initially we (as individual) will fail but collectively we will start succeeding. I am hopeful that once we start from ourselves (individually), each one of us would be able to avoid situations where we would talk about Newspapers of 3-Feb-12 (2G Scam), other scams and the bad shape of world economy. Hoping that we would save our energy to concentrate on something constructive. This is the third blog in the series of Connecting the dots… which started from way off the track blog on cricket. Cartoon Channel -> Blog on Cricket -> Amar Chitra Katha -> an article by Darrell Mann -> Blog on Innovation. 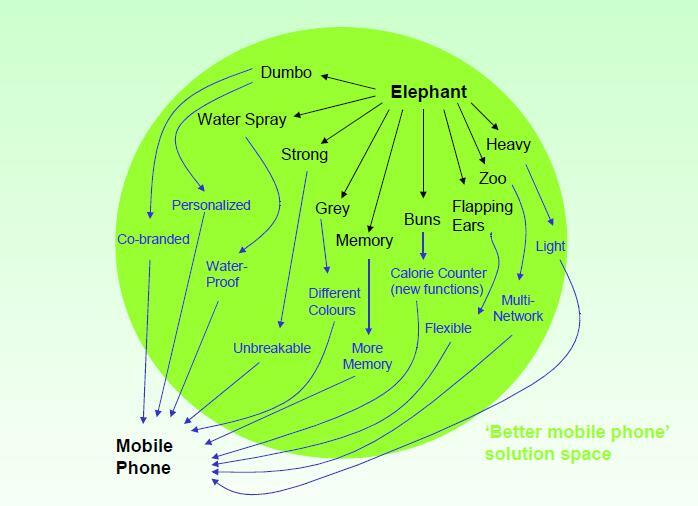 Once in a tutorial Dr Darrell Mann (a renowned TRIZ expert and professional) created a solution space for Better Mobile Phone starting from an Elephant. Surprised! Yes he did that in 2006 in a tutorial session. And if one knows how to connect dots one can design/formulate or conceptualize faster and better. ‘why we do not have any local Indian Character?’ I asked myself. Then answered to myself – ‘Hello! do people know that Chess and Badminton are conceptualized in India? Well in India Cricket is a sport rest are time pass. Perhaps true! How many notice, that the first archery competition in world happened during the time of Mahabharat, when Arjuna hit the eye of a fish. Oh! Olympics, from 1996 onwards in each Olympics India brought at least one medal home’. Mahabharat, cartoon characters and kids not knowing about the Indian Mythologies – wow! that was what was the premise on which Amar Chitra Katha was born. Innovation requires flow of thoughts, flow of thoughts from different directions to a solution or an offering (Product/Service). However, we cannot rely on random thought and free-will for solutions. We need solution better and faster. Innovation requires open mind, ability to connect dots and think and look beyond obvious. At the same time it does not mean innovation is a play of experts, if someone is open and willing to learn one can learn approaches to be innovative. All the freewheel thoughts were the random stimulus and I connected them in the form of blogs – Cartoons, Cricket and Amar Chitra Katha. Contradictions! We live in a world of choices, conflicts and trade-offs. The following idiom says it all – “you can’t have your cake and eat it too!” In this regard, there is an approach to solving such problems wherein you are faced with contradictions. The theory is named TRIZ – the theory of inventive problem solving. By way of example, let me introduce a contradiction in simple terms. Let’s say you want to increase pressure in a vessel and the result of that also reduces temperature, which you do not want. The conflict in this case is clear: increasing one parameter affects the other parameter negatively, or, changing a parameter positively affects another parameter negatively, which creates an undesirable outcome. The idiom used above “you can have your cake and eat it too!” implies a potential physical contradiction- You want a cake but you cannot eat it! TRIZ is extracted from the field of engineering. This methodology helps resolve the contradictions without compromise. Lately, I tried applying concept of TRIZ in class of Prof John Davis (Dean SP Jain Center of Management, Singapore/Dubai) on Sales and Channel Management. There was a company which had acquired many diverse companies and thus had a dilemma of structuring its sales force differently to increase efficiencies. The range of organizational options included – letting the sales force be as they were (independent), merge the sales forces, using distributors, or a unique combination of these or alternative structures. The solution of merging or having independent sales forces had their own positive and negative implications. This type of issue can be termed as “physical contradiction” in the language of TRIZ. To solve physical contradictions separation principles are applied. So, when applying the principle of separation on condition and space, we can identify that the sales force could be geographically separated (separation based on space). The conditional separation in this case was manifested in determining big account vs small accounts for both distributors and an in-house sales force. Additionally, the conditional separation was represented by a merged sales force (one bag) vs a separate sales force (silo) for product offerings. Thus, though TRIZ was distilled from field of engineering but we can apply principles of TRIZ to solve problems in different functions (e.g. sales in this case) and other non-technical fields. I am trying to apply TRIZ in different fields and I have also identified application of TRIZ in marketing, strategy planning and areas where conflict appears, though I feel there is a lot more to be done in terms of making it easier to apply. I have written few blogs using concepts of TRIZ, so let me explain what is TRIZ? It is a problem solving methodology, more below from my earlier post at other place. How do we look and try to solve our problems? The above joke may give you an idea about the “circle of intellectual dominance” I am talking about, that is everyone tries and looks into his field of expertise for finding solution of any problem. This “circle of intellectual dominance” called “Psychological Inertia”, which limits even experts to come up with better perhaps “OBVIOUS”, solutions (in terms of expert of other field) for any particular problem or improvement. TRIZ provides a big leap for experts to learn to look beyond their area of expertise and get a general look at a problem, find a similar problem in other field and its method of solving the problem then customize the solution according to need. Thus, it gives a generalized method for solving virtually every problem in any field. TRIZ is a Russian acronym which means “Theory of Inventive Problem Solving”. This concept and theory came in to existence when a Russian Patent Expert Genrich Altshuller and his colleagues studied over 200,000 patents looking for problems and the way they were solved. Of these only a small fraction 40,000 had somewhat inventive solutions; the rest were straight forward improvements. With these studies Alshuller came up with a systematic approach, termed TRIZ. It was a generalized way for finding out solution of any technical difficulty or for any further improvements. 1. Identifying the problem or finding out opportunity for improvements in the present product, design etc. 2. Formulating the problem and searching for similar, previously solved problems with an overview to understand the concept of solution. 3. Looking for analogous solution(s) for presently defined problem or conceived improvement. 4. Applying the best identified analogous solution. Thus, TRIZ gives a general concept, for virtually every field, to find out opportunity and solutions for problems or improvement sought. I myself have played with concepts of TRIZ beyond engineering fields such as social sector innovation, medical field, Travel infrastructure in Mumbai and currently working in management domain specially economics, marketing and finance. Prof Mankad said in our class ‘there seems to be possibility of double dip’ while teaching us macroeconomics. I have written on this in my blog at times. At times question comes in mind, why not using concepts of one field to the other the way we do it in TRIZ (The theory of inventive problem solving). I recalled a news shown on NDTV (it was shown in 2008 somewhere in Aug-Nov). I remember this news because it was unique and I rarely watch TV(:)). So, here comes use of TRIZ to tackle the economic crisis in a non conventional way. I am sharing the idea with a hypothetical scenario. As an everyday ritual Vijay logged on to his mail box, amongst others the mail from HR stared back at him. Feeling the heat of economic crisis the company was in process of layoffs. How many Vijays have the same stories to recount? How this time can bring us together and make us more innovative to reckon with the challenge – this challenge is not questioning us only on one front of economics but also on cultural and creative fronts? Employee-employer relations are unlike marriage where a pair takes an oath to live together, and share all the grief and joy. In this tough time each should support other for survival and future growth and say – “yes! We are for each other”. It has been proved important and useful in the Japan after the World War II. Lately, a group of ex-workers of a mill bid to revive a dead mill; Garware Nylons Ahmednagar. All the workers joined hand for revival of the mill. In this successful bid the sense of belonging was such that the families of ex-employees even-handed over their jewelery and large sums from their provident fund. Way back in 1996 instead of shutting the mill down, if the management and the workers had come together and decided to make a plan to save the mill on a model of a marriage by surviving in the tough time, they might have come up winning and everyone might have lived happily. In recent week there was news in FT that EU is considering bailout in some forms. Bailout is a ‘self-mutually exclusive’ option that is – bailout is needed in the toughest time but it is ill-advised as it is ‘passing-the-buck to taxpayers’. Government needs to bail out various industries; however, the companies may misuse the amount. In such case questions are asked that – How to make companies accountable for the same? When to loan, how to loan and how to gauge the performance of the waived organization? Bailout can be tackled when government separate this option of bailing-out upon condition of time and space i.e. conditional separation of amount of money offered, accountability of use of money, time-to-time checks and balances. Separation of assets and liabilities can be one more initiative and offering incentives other than monetary could be other. Additionally, if we attentively look around we can learn from nature too. Birds fly in flocks, why? Because flocking helps conserve energy, defends against predators and facilitates orientation and communication. Energy is everything involved in the business – various resources, money and time – it needs to be conserved. Instead of salary cut and layoffs companies can take loans from employees, offer shares or bonds to the employees to generate money. This not only can engender trust in teams but also can invigorate teams to work for their own company. Are you keeping those many Vijays in your team? Are you willing to take on the challenge by sticking together, being creative and innovative to carve success over the slump to ply in the present to fly in the future? These clauses seem to fail. Euro is struggling because of exposure to stupidity of investment banks and naivety of European countries for example Iceland. Next to show domino effect was Greece in first half of the year, Ireland now and perhaps –Spain, Portugal next to face economic doldrums. “With Great power comes great responsibility” said Uncle Parker [to Peter Parker – Spiderman]. Germany needs to understand it, they need to change their promises or the spiral of over exposure and unified economy [not only of EU but also the whole world] would eat half of our generation. Balancing this would make Germany either very strong worldwide or make it pauper. 2.	growing % of population in old age e.g. less working population. India, is it? Perhaps, yes! I may be biased yet the economic, demographic and intellectual capital it posses, this country seems the contender for coming 10-20 years. The secret lies in the leadership, current duo of Dr Singh and Mr Chidambaram is a good combination. However, India needs to be cautious building next leadership line is the need of the hour.